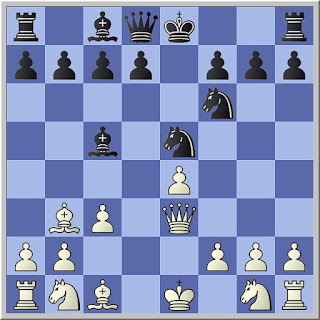 This week's Friday Chess puzzle is from Leipzig in 1903. It's Leonhardt playing Black against 'an amateur'. reaching the position above. White cannot capture the bishop, so instead played 8 Qg3 and attacked the exposed knight on e5. Can you see how Black forced an immediate win after 8 Qg3? Answers to Chess Tales. I'll publish the solution next Wednesday.